Overview - It is 1942 and the German submarine fleet is heavily engaged in the so called "Battle of the Atlantic" to harass and destroy English shipping. With better escorts of the Destroyer Class, however, German U-Boats have begun to take heavy losses. "Das Boot" is the story of one such U-Boat crew, with the film examining how these submariners maintained their professionalism as soldiers, attempted to accomplish impossible missions, while all the time attempting to understand and obey the ideology of the government under which they served. On the brink of destruction, in the approaching shadow of death, sometimes all we truly need to survive -- is each other. Set against the fiery backdrop of "man's inhumanity to man," Wolfgang Petersen's 1981 film 'Das Boot,' ultimately examines the more hopeful truth that lies at the center of every war. Down in the darkest depths of the Atlantic Ocean, a group of soldiers become brothers, having nothing to rely on but themselves. While war may always bring out the worst in man, for one brief moment, together they brought out the best. 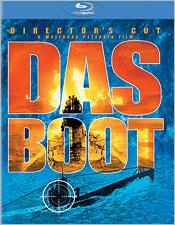 Based on the 1973 novel of the same name, 'Das Boot: The Director's Cut' follows the crew of a German U-boat during WWII as it embarks on a mission against allied troops. A war correspondent (Herbert Grönemeyer) joins the vessel and acts as a sort of audience surrogate, introducing us to the shut-in, grimy world of submerged warfare. Under the command of Capt.-Lt. Henrich Lehmann-Willenbrock (Jürgen Prochnow) the boat and its crew brave the harsh, confined conditions of submarine life, and the maddening roller-coaster of mundane inaction and terrifying danger that awaits them at every turn. What follows is a fascinating, tense, inspirational, and tragic rumination on the perils of war and the powers of brotherhood. The cast is uniformly excellent. Each actor brings a realistic and totally believable level of strength and vulnerability to their roles. The passage of time is only designated by the hair on their faces, and seeing them transform from baby-faced youths to hardened, bearded men is a powerful sight. The real standout here though, is definitely Jürgen Prochnow. The actor exudes quiet confidence, wisdom, and calm like no other. He is exactly the type of leader you would want to follow into battle. Though he almost always seems cool and collected, much like the film itself, the character too has momentary bursts of external emotion. 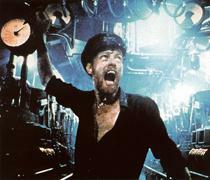 One scene sees the man sticking out of the top of the submarine, explosions all around, shouting from the deck with crazed fury and passion burning in his eyes. This duality of passive composure, and unbridled madness extends far beyond the character, and into the stylistic trappings of Petersen's directing choices themselves. The filmmaker employs a stark, gritty, claustrophobic style of hand-held camerawork and long, uninterrupted shots. The set was constructed to mirror a true-to-life, WWII era U-boat, and this level of authenticity pays off tremendously. The ship truly feels like a living, breathing vessel, and through Petersen's fly on the wall, roaming camera and unbroken sequences, we feel as if we are part of the crew, drenched in their sweat, fear, and dwindling, fragile psyches. The movie features long stretches of inaction, simply showcasing the day to day banality of working on a tiny submarine as the officers slowly reach their breaking points. Routines and nightly dinners become our windows into their minds and states of being. Petersen uses these quiet moments to develop his characters, slowly allowing us to get to know them, all while lulling the audience into a false sense of calm. Tension is ramped up by the constant waiting, knowing that potential threats lurk just around every corner. The director expertly punctuates this monotonous serenity with sustained bursts of chaos. When all hell does eventually break loose, Petersen unleashes a visceral explosion on the screen, turning the images into a maddening, shaky torpedo of excitement and danger. One of the most powerful scenes, outside of the film's famous climax, comes in the wake of a torpedo attack on a British vessel. The Captain and a few officers head to the deck to confirm the success of the battle, and there, cast in a hellish red glow, they watch the burning ship sink as drowning British crew members cry for help that simply will not come. The scene has an almost surreal feel, with a haze of torrid death billowing all around, but its stark truth is all too real. The Captain and his crew look on in horror at the consequences of their actions. This is war, and while there is no regret, the shame on their faces speaks volumes, effectively saying all the director has to say about the complicated subject. Despite its historical setting and potentially controversial focus (German soldiers during WWII are rarely the heroes of a movie), the film somehow manages to avoid any kind of offensive political statement or commentary. While Petersen certainly offers no kind sentiments toward the Nazi's atrocities, he also doesn't go out of his way to apologize for them. Hitler's horrors were what they were, unspeakable and monstrous acts, but this isn't a film about those events. Despite their place in the larger context of Nazi Germany, the crew of the submarine almost appear to exist in their own universe, seemingly removed from the greater terrors waging across Europe. This isn't a movie about the ideology of the German war effort. At its heart, this is just a film about a group of men, completely isolated from the bigger machinations and maneuverings surrounding them, banding together, working as a team with their lives on the line to survive. Friend or foe, German or American, that is a story that anyone can relate to, and when conducted with as much integrity and nuance as this, even cheer for. 'Das Boot: The Director's Cut' is a truly remarkable film, much deserving of its classic status. Though over three hours in length, the movie never once drags, and each moment of development and action is essential to the power of its storytelling. When the climax finally comes and goes, and ironic tragedy cruelly strikes the film's sprawling cast of characters, the true genius of Petersen's slow burn approach really comes into focus, as we realize just how much we have come to care about each and every crew member. Richly textured and expertly directed, 'Das Boot: The Director's Cut' is both a terrifying condemnation of the horrors of war, and a shining example of the will of man. Sony brings 'Das Boot' to Blu-ray in a 2-disc set with both the 208 minute director's cut and the 149 minute theatrical cut of the film. The main difference between the two versions is the inclusion of several more scenes involving individual characters' storylines that flesh out and expand upon their personalities and emotional arcs. A longer television miniseries version was also made (not included here) and the director's cut acts as a sort of compromise between the TV version and the theatrical edit. Both cuts are presented on separate BD-50 discs housed in a standard case with a cardboard slipcover. All special features, except for the commentary track, are presented on the second disc along with the theatrical cut. The packaging indicates that the discs are Region A, B, and C compatible. The movie is provided with a 1080p/AVC transfer in the 1.85:1 aspect ratio. Both cuts exhibit the same strengths and weaknesses. While not bad, the video presentation is a bit underwhelming. The print is in good shape and has been cleaned up nicely through some painstaking restoration techniques, with no real signs of age or damage. Grain is present early on, but seems to come and go throughout. The movie as a whole has a pretty soft and flat look to it. Certain scenes and close-ups can bring a pleasing level of detail, showing off the weathered, desperate faces of the crew and the intricate design work of the sets, but for the most part, the visuals aren't very sharp. Despite the sometimes hazy image and intermittent lack of grain, I don't think DNR is the main cause (though it's certainly possible and likely that some was applied), and the film's appearance seems to simply be a result of the original photography. Colors are fairly muted, going along with the movie's gritty and grimy atmosphere, but there is some strong use of blues and reds with the boat's lighting design. Black levels are deep and contrast is natural. 'Das Boot' may not exactly sparkle on Blu-ray, but then, it's not really supposed to. The movie's dark, dank, and claustrophobic cinematography brings an inherently rough look that may lack some depth and detail, but still feels largely authentic and serves the movie just fine. Audio for the director's cut is provided in a German DTS-HD Master Audio 5.1 track, an English DTS-HD Master Audio 5.1 track, and a French Dolby Digital 5.1 track. The theatrical cut has a German DTS-HD Master Audio 2.0 track and an English DTS-HD Master Audio 2.0 track. Subtitle options include English, English SDH, and French for both cuts and additional Arabic, Danish, Dutch, Finnish, Hindi, Norwegian, and Swedish subtitles for the director’s cut. When the director's cut was produced several years ago, the filmmakers took the opportunity to completely redo the movie's sound design work with all new effects (only the dialogue remains from the original track), taking advantage of the numerous advances in surround sound mixing. The results are actually quite spectacular, using the movie's original award-winning audio as a reference to open up the soundstage dramatically, adding great depth and immersion. Dialogue is crisp and clean and always easy to hear. Surround use is fantastic, creating a thrilling atmosphere that pulls the viewer right into the cramped submarine. Clanking metal, footsteps, water dripping, and various other mechanical noises litter the soundfield from all directions. Hearing enemy ships slowly fade in and out through the rear speakers ups the tension and subsequent relief of the scenes perfectly. Bass is great, packing a thunderous punch with every explosion and crashing wave. Dynamic range is also strong, with a wide gamut of frequencies. Balance between all of the elements is impressively done. Though much of the dialogue is either whispered or shouted over torpedo fire, none of it gets lost in the shuffle. The 2.0 track on the theatrical cut is also strong, though it of course lacks much of the immersion of the new 5.1 mix. While a lot of the old effects are less robust and lively, the design work itself is still good, offering a nice two channel presentation. Both the new surround track and the original 2.0 track for the theatrical cut sound great, and its nice to have both versions presented. The audio design work is truly exceptional at times, really adding to the impact of the film. Sony has provided an excellent assortment of special features, many of which are exclusive to this Blu-ray. All of the supplements are presented in 1080p with Dolby Digital 5.1 tracks unless noted otherwise. Commentary with Director Wolfgang Petersen - Director Wolfgang Petersen is joined by actor Jürgen Prochnow and director's cut producer Ortwin Freyermuth on this commentary track. The trio offer a fairly jovial, informative, and entertaining discussion of the film. Some topics touched upon include methods used to achieve the effects in the movie; remastering the sound; salvaging footage from wet film stock; working with hand-held cameras on gyroscopes; losing a certain, critical prop during shooting; and one actor's apparently very authentic drunken performance. Petersen also elaborates on the film's anti-war message and the controversial reaction it had in Germany. The track as a whole is definitely worth a listen for fans of the movie and gives a nice, comprehensive overview of the production. 'Das Boot: The Director's Cut' is an epic, but still intimate story of war and survival. With a richly detailed script, strong performances, and some truly exciting visual direction and sound design, the film manages to earn its mammoth running time and classic status. Though the video isn't terribly impressive it's quite serviceable, and the audio is fantastic. Supplements are plentiful and informative as well. Basically, this is a great disc for a great movie.